Winter is coming, and you need a travel jacket that actually fits in your backpack. Impossible? Not really. All you need to pack a lightweight carry on bag for winter is a good base layer *cough* MERINO *cough* and a rugged weatherproof jacket that can handle a little weather and some chill. Don’t just stuff a jacket in at the last minute. A truly great (aka “flexible”) winter packing list starts and ends with the right jacket. Here’s our complete rundown of some of the best lightweight, waterproof, insulated, comfortable, and even tech-friendly travel jackets to pack for your next winter trip. Despite what you think, it’s a rare winter trip that requires a heavy jacket every single day. For most European destinations you just need that extra top layer for chilly nights or bad weather. For a lot of trips, my expensive travel jacket remained nestled in my bag taking up space, so unless you’re sumitting Everest, a lightweight travel jacket is key. This Patagonia Crankset travel jacket is what a lightweight winter travel jacket should look and feel like. Weighing less than a pound, it’s water-resistant, stylish, insulated, with adjustable cuffs and hems, and it packs into its own pocket/stuff sack. Not too shabby. Add zippered pockets with a reflective zipper pull, stand up collar with a stowaway hood (love those), and fancy features like a back vent and even a headphone compatible left breast pocket and you’ve got a pretty great winter travel jacket for well under $200 from one of the most trusted names in the business. 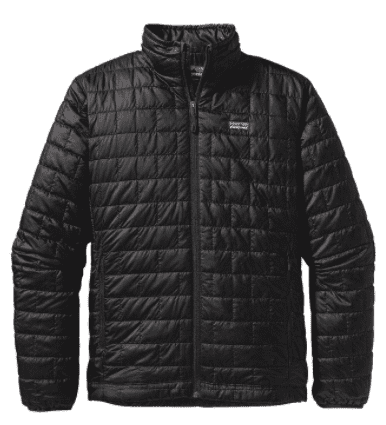 If you want to take your winter jacket to the limit, the even slimmer Patagonia Nano Puff travel jacket is the way to go. 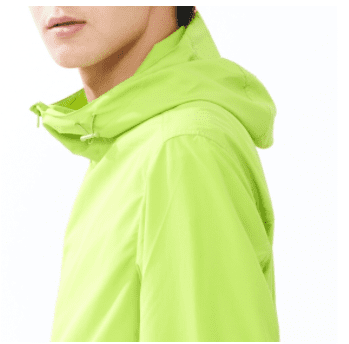 Insanely lightweight while still being warm, this jacket is windproof, water-resistant (DWR treated), and will maintain up to 96% of its warmth rating even when wet. Not bad for a jacket you can crumple up in your fist. Sometimes the best winter coats are the simplest. 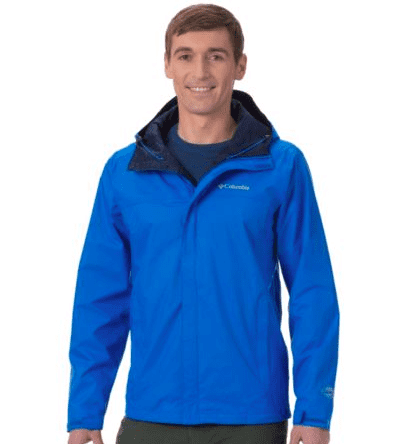 The Craghopper Compresslite travel jacket is exactly that. Extremely lightweight, warm (even when a little damp), and teeny tiny when it’s all packed up. A great entry level, easy to pack winter jacket. A great travel jacket is about more than warmth and waterproofing. 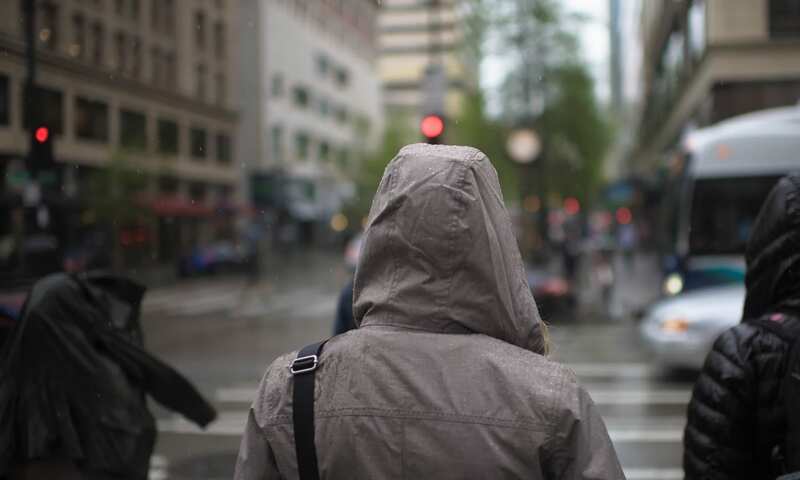 The right jacket can be an extra carry on for the flight, a safe for your wallet and passport when you’re out on the town, and a dry place for phone and camera in wet weather. Here are some great travel jackets that are packed to the hilt with features for today’s digital nomads. The BauBax windbreaker is part of a full line of outerwear launched after the record breaking success of the BauBax sweatshirt on Kicktstarter. 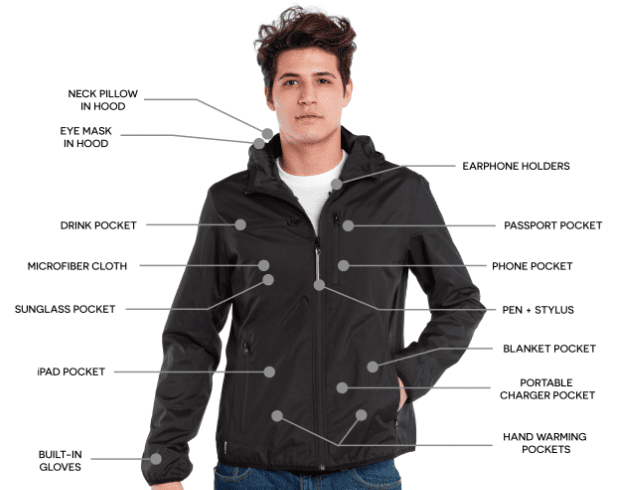 The windbreaker features all the same gizmos and gadgets–like a built-in inflatable neck pillow, eye mask, gloves, iPad pocket, stylus (it’s in the zipper), water-resistant phone pocket, double lined hand warmer pockets, passport pocket, and more. If you want to squeeze every ounce of functionality out of your travel jacket, look no further. Also, check out the Women’s Baubax Windbreaker ($119), or Baubax “Bomber” Travel Jacket ($139). Equipped with 13 pockets for on the go digital nomads, the ScotteVest Pack Jacket is a tech friendly beast. 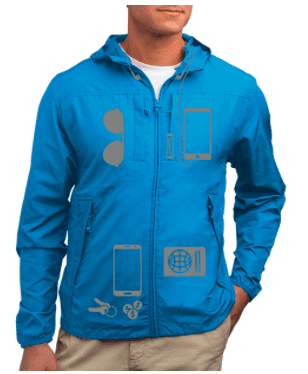 In addition to the standard two zippered pockets this jacket has two chest pockets, an extendable key holder, sunglasses pocket, passport pocket, iPad pocket, phone pocket (with headphone cable access) and the “weight management system” to keep everything in place and balanced so you don’t bulge and sag like a tourist. However, the best pocket might be the back pocket. You can stuff the Pack Jacket in and it’s a handy case. 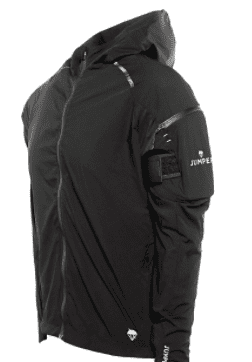 Designed by a former Army Ranger, this jacket is built for active travel. Featuring a water-resistant, super lightweight, stretchable “ninja” fabric weave, breathable back vents, contoured hood, reflective strips, and adjustable cuffs and hem. 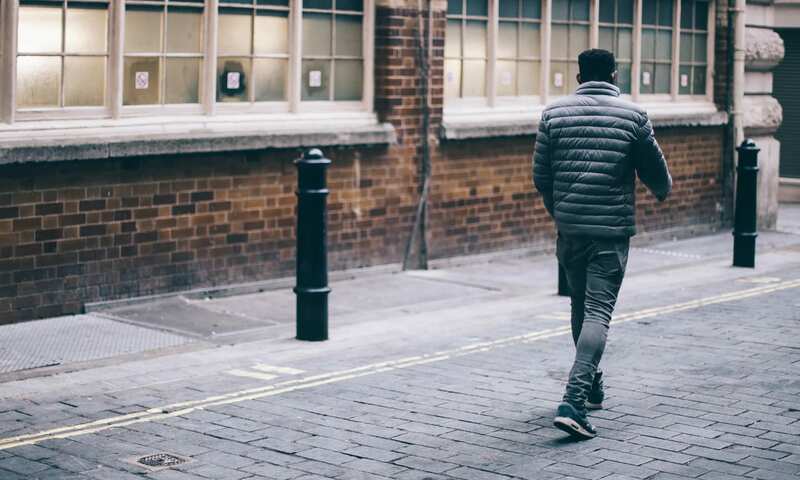 The action jacket is designed to be tailor fitted to your body so you forget you’re wearing it. However, the coolest part has to be the phone pocket. The seam sealed zipper and adjustable tension strap keep your phone dry and snug against your arm. No more bouncing around on that morning jog, or sprint through the airport terminal. Perfect for listening to your favorite tunes, staying dry on a hike, or throwing over your insulated layers, this travel jacket packs down into an attached pocket and “weighs less than a banana.” Seriously. This might become your new favorite travel jacket. 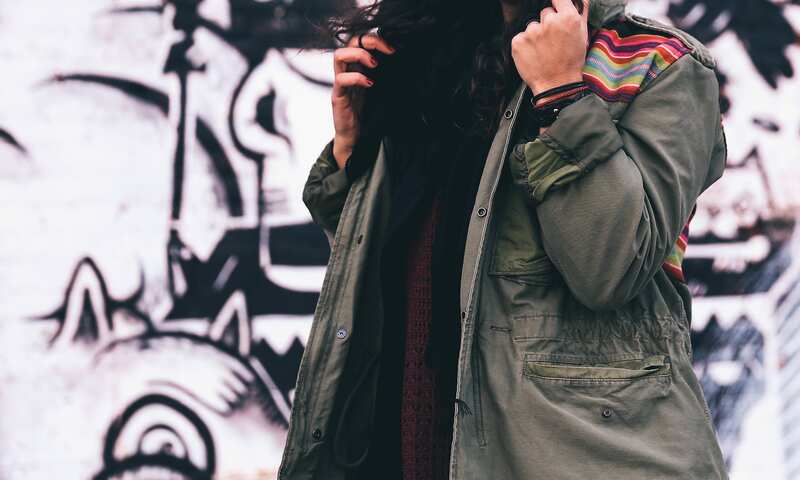 Sometimes you want a great travel jacket but you don’t have a ton of money to invest in the top of the line, because you spent all your money on a plane ticket! Here are some perfectly serviceable, budget minded jackets for winter travel. I don’t know if you’ve noticed, but over the past three or four years, H&M and Uniqlo have quietly become the best budget alternatives for travel gear on the market. 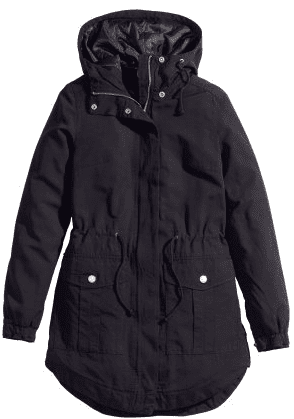 Case in point: H&M’s Lightweight Parka. 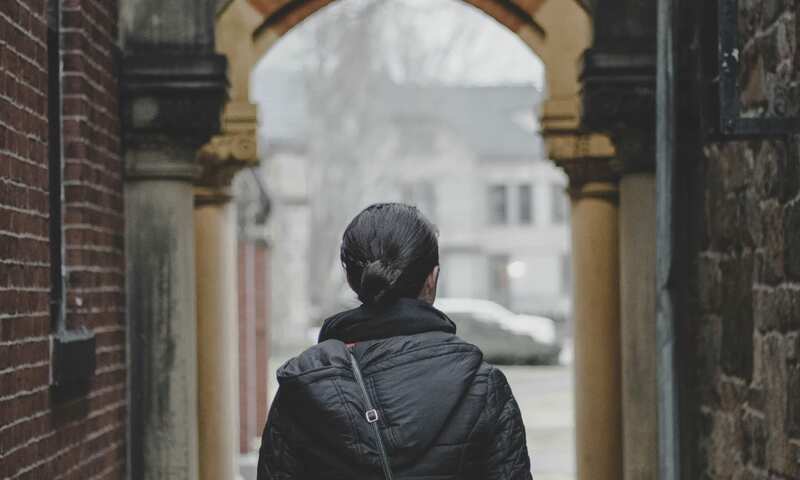 This jacket is the perfect weight and thickness for winter travel, and features essentials like a lined hood, quilted interior lining, and drawstrings at the waist and cuffs. 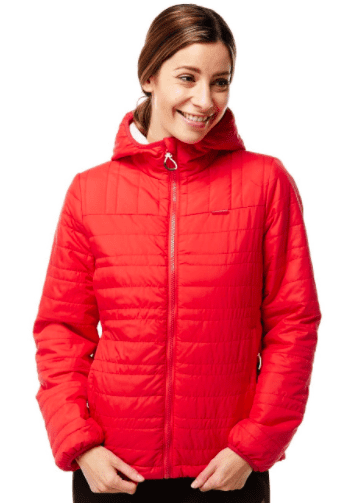 And the clincher–this jacket is only $25. Even if it gets thrashed on your trip, who cares? It packs down small, looks great, and keeps you warm all for the price of a good meal. Sold. This Uniqlo Pocketable Parka is a winter travel kicker layer for less than $20. Water-resistant DWR treated, it features a stow away hood, zipper pockets, and interior passport sized pocket and it’s only $20. Stop it. When you say “waterproof travel jacket” you mean a shell. 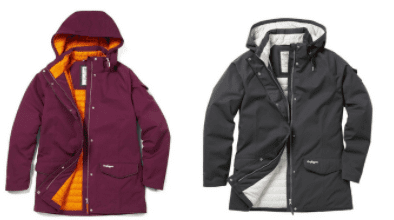 Shells have been a crucial part of winter packing forever, and while the outer layer shell hasn’t changed much in the past 20 years, there are still some pretty great options. The Craghopper NatGeo 250 travel jacket was designed for adventurous photographers and journalists. If this jacket can live up to the rigorous field test of NatGeo employees it can handle whatever adventure you have in mind. 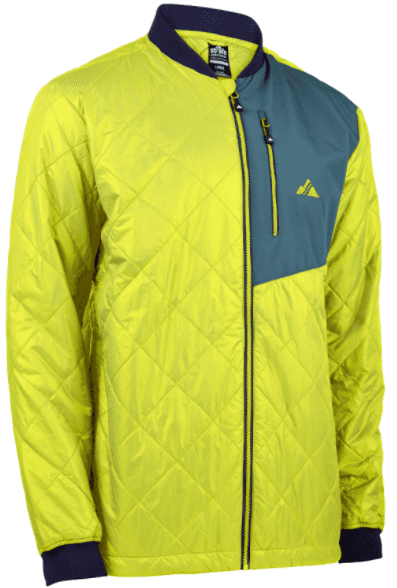 Featuring “Aqua Dry” and “Thermo Air+” waterproofing and breathability, as well as a pocket with built in RFID shielding technology (nice), this jacket is for the pros. I love the flexibility of a 3-in-1 travel jacket, but so often the insulated layer/outer shell combo is more like a 3-in-none. 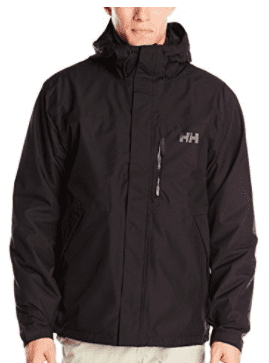 Not so with the Helly Hansen Squamish jacket. The insulated layer is great for keeping you warm around the bonfire or a chilly clear night out without the added protection of the outer shell. Just zip it off and you’re good to go. Bonus: It doesn’t look like the “inside” of a jacket, so that’s good. The outer shell layer is perfect all by itself for a fall hike with rain in the forecast. Fully seam sealed so it’s wind and waterproof, the jacket features nice touches like a storm flap on the front zipper pocket, and waterproof pockets for your phone, as well as adjustable cuffs (super important). If you wear both layers together take solace in the fact that you can adapt to warmer temps or sunny weather as the day changes. The Columbia Watertight II windbreaker is definitely the lightest travel jacket on the list, and easily my personal favorite. A slim, carry on friendly top layer, this travel jacket simply performs. It keeps you warm, dry, and doesn’t weigh you down. What else are you looking for? I packed this rain coat for my 800km hike across Spain on the Camino de Santiago this past October. When every ounce counts, you want a jacket that’s worth it, and the Watertight performed beautifully. This jacket stuffs into its own pocket (easy to pack), and it kept me dry in several downpours in the high altitude of the Pyrenees. Elastic on the cuffs, waistband, and even the trim of the hood kept the wind and wet off my skin and locked in my body heat. Pro Tip: If your jacket doesn’t pack into a stuff pocket, save space by rolling it into a tight cylinder and wrap a thick rubber band around it to keep it bundled in the bottom of your bag until you need it. Looking good while you travel is important. 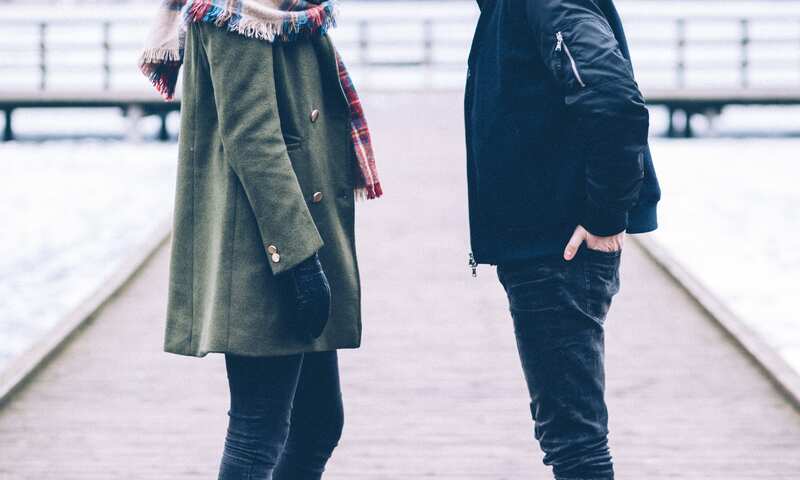 Particularly in Europe, land of stylish people and a place where North Americans notoriously stand out, lagging behind the fashion by at least a season. Here are some suggestions to keep you warm and looking good in Europe this winter. I know, I know. 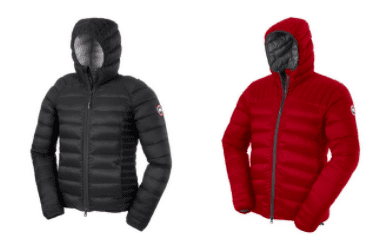 Canada Goose is super expensive and you’re totally “that traveler” when you wear one, but I’d be remiss if I didn’t mention these top of the line travel jackets. The Brooklvale Hoody is a lighter, leaner jacket than the flagship parka, and the versatility really comes through. This jacket looks great, but really is built for winter. 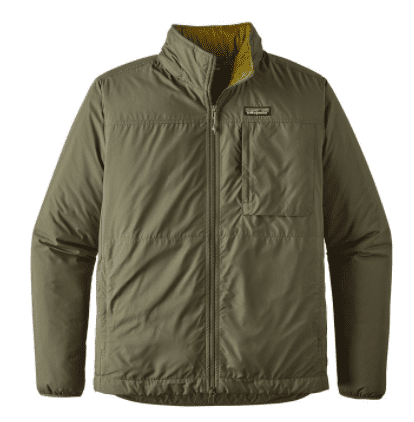 The quilting and patented duck down means this jacket is rated for -15C (that’s icy), and the “Veraflex” fabric means you can wear it in practically any environment. Even better, the Brookvale hoody packs down into its own stuff pocket for increased packability. Expensive, but worth it. A modern twist on the classic bomber look, if you’re not weathering any major storms, this is the jacket for looking good in winter. Made from a stretchy, breathable fabric filled with warm, “diamond quilted Primaloft Silver insulation” (so fancy), the Strafe Drifter Jacket is a premium lightweight stylish travel jacket. Ok, yes I understand that the Poler Napsack isn’t a “jacket,” per se. But you have to think a little bigger. Just imagine rocking into the bar for some apres ski in one of these bad boys. You’ve got the draw string cinched up tight around your waist, the hood up, the zipper playfully halfway zipped, hands in your pocket. You’re cozy, you’re stylish, and I’ll be damned if you’re not the most interesting person in that whole damn bar. If you want to make an entrance, this is the “jacket” for you. All joking aside, this sleeping bag rules. 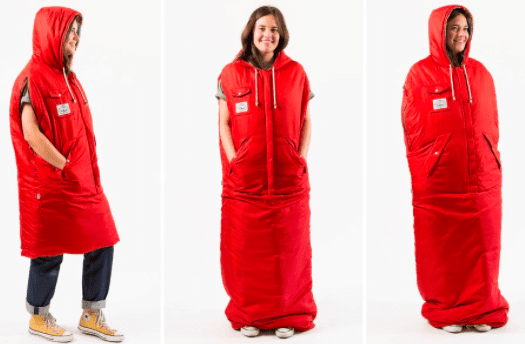 If you were gonna pack a sleeping bag for a European winter trip and want to bring a good coat, look no further than the Poler Napsack. Psych. I’m not recommending anything with the word “heavy” in it. If you’re really on an Arctic trek, this isn’t the travel jacket list for you. Digital nomads and carry on packers have to fight the cold with a merino base layer, a comfy sweat wicking t-shirt, a wool “shaket” and a breathable outer layer shell/travel jacket. If it gets warm, you ditch a layer. If it gets super cold, add a scarf, hat, and gloves. Don’t buy a heavy jacket unless you’re off to study emperor penguins. The right travel jacket can actually save you space in your carry on bag. I know, it sounds crazy but it’s true. Find the perfect travel jacket and go anywhere in style and comfort this winter.